*The Shoes: Crucial for running and my poor one's were long over due for retirement! I headed to the Nike Town for some help, admitted that I was a runner, and saw what my options were. I found these bad boys- The Nike LunarGlide+ 3 for maximum stability, perfect for long runs. I have to admit that they are brighter than I had wanted... but all the others either had no pink in them or were kind of boring... so I went bold and bright!!! Switching into these before the race made me nervous as I had to brake them in in less than a week... but luckily I had no problems or blisters for that matter and it felt like I was running on clouds... new running shoes for race day: check! *I Pod Arm Band: If you know me, then you know I can not run without music!!! I don't know what it is but my legs just stop running and my brain and will power give up... so maybe I'm not as true of a runner as I thought but hey I'm working on it. I was so excited to be getting my I phone just in time for the big day and decided to do a test run with my new gear... so glad I did! Ran into a couple of minor problems... I didn't realize how sensitive the touch screen is and accidentally ended a race early... Couldn't really see my I phone screen so changing tracks became really difficult... And getting to the side of the phone to lower or raise the volume was kind of impossible. On the bright side, I did like how comfortable the band fit around even my skinny biceps and that it eased the ache in my right shoulder that I usually get from holding my Ipod... The sound quality was way better... And with the nike+ app I get someone telling me my pace for each mile... In the end I plan on making a really good playlist so I won't have to be messing with it at all once I start the race... new music provider and carrier: check! *Fanny Pack: I have to stress that under all other circumstances, I hate these things!!! But I hate having to run with my keys in my hand even more and hubs always saying I should have my I.D./money on me when I'm out running just in case of emergencies... so I decided to why not? I found this really small and streamlined one, The Ultimate Performance Wooky, that has just enough room for the essentials- keys, chap stick, and plastic. My first couple of runs with it were tricky... I didn't know how high or low or tight to strap it on and it ended up riding up after a couple of minutes. By the last run before the race, I figured out that if I wore it really low on hips and pulled it as tight as I could, it stayed in place for all of my run. Since hubs was coming out to support on the day of the race, I didn't really need this one and decided not to wear it. 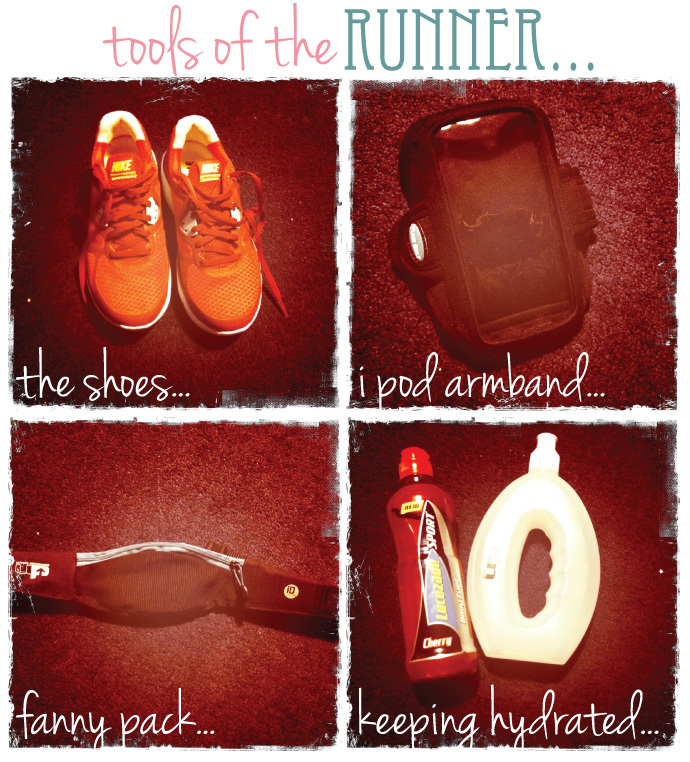 It is a good tool for training runs though and would recommend it... fanny pack for training runs: check! Keeping Hydrated: This is another area that should always be taken very seriously. Ive been carrying with me a plastic water bottle on my longer runs, but the way you have to grip it leave my hands and fingers feeling cramped. So I switched over to the Ultimate Performance Runners Bottle which is designed with a hole in the middle so you can just slide your hand in to carry. I noticed that my hand is now in a very relaxed position and the pull cap makes it easier to drink without getting stuff all over my face. Another new trick I just started using is Lucazade Sport. Now I normally don't like drinking sports drinks and much prefer water, but hubs kept insisting that with the long runs I was doing, my body needed to rehydrate quicker and also replace the high amount of carbohydrates that I was loosing. I started with the cherry flavor and honestly I don't like it... reminds me of cough syrup... but I did notice that I had more energy throughout my run and was able to maintain my original pace for longer so I'll stick with it... and maybe try another flavor... keeping hydrated and carb. loaded during the race: check!